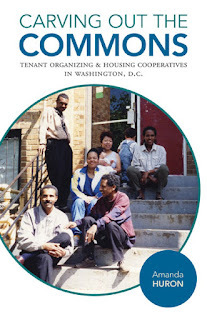 Unbeknownst to me, independent research Amanda Huron has written a book about DC's limited equity low income housing co-ops, which is opportune given my recent writings on the topic, including "Not particularly radical: housing ideas from Right to the City." Amanda Huron will be at the American University Museum at the Katzen Arts Center on Wednesday, April 4 at 4:00 p.m. for a reading and signing of her new book, Carving Out the Commons: Tenant Organizing and Housing Cooperatives in Washington, D.C..
She's also speaking in Baltimore tomorrow, at Red Emma's Bookstore and Café. Coincidentally, Red Emma's is a workers cooperative. I'd be curious to compare co-op in strong market vs weak market; strong market can introduce some difference incentives. wrt your first point, please expand. Unfortunately, I was expecting a package and didn't want it potentially stolen if I wasn't home and it wasn't delivered til after 4pm, so I missed the talk. Don't think I'll be making it to Baltimore. easy to look at housing as a "social value" in a weak market and say you don't want to make money on it. IN a strong market, opposite problem. Then you've got the costs of conversion, which I think is one reason it is our of favor in DC. at the nat. trust conference in St. Paul in 2007 I went on a tour led by a local preservation group. Along the way they lauded themselves for doing preservation with no displacement. On the tour, I openly scoffed. I said it's easy to do "no displacement" when there is limited, especially almost zero, demand. Similarly, at a conference in Balt. a couple years ago, one of the leading housing advocates of the city lamented how far behind the times Baltimore was for not having an inclusionary zoning policy. Afterwards, I was talking with a leading author/housing research guy, Alan Mallach, and we both laughed over that statement, making the point that with 50,000+ empty lots and buildings, Baltimore's problem was lack of demand, not ensuring new housing had a swathe of affordability. So yes, you're right. HOWEVER, where the cost of conversion doesn't make sense with a SFH that remains a SFH, it's doable if you can make two units out of it (by adding a floor to a rowhouse) or splitting a lot into two if it will be able to meet the building regulation requirements. That's where I used to sometimes get zonked, but not anymore, because now I know how to recognize the signs. That's where the market is now. We get a couple mailings a week offering to buy our house. Yesterday, a f*ing phone call. And I angrily hung up on a similar call a month or two back. I wish I would have had the poise to listen. My point about cooperatives now is as a form of semi-permanent lower cost housing. But it requires special circumstances to work and would have to have DHCD/nonprofits in the drivers seat. E.g., it'd be something to do at the Anacostia Metrorail station, even Takoma or Fort Totten. But it would require way more vision and thinking than the area is capable of. E.g. LISC has put a lot of money into "warding off gentrification" vis a vis the Bridge Park. They would have had a lot more impact creating an affordability housing cooperative fund 10+ years ago, and focusing on Metrorail stations. The same could be done with the Purple Line, etc.